He has, however, missed out on the 2004, a situation that continues to torment him. For he is still at a lost as to the treatment he has been receiving from the local athletic association. Ballantyne thinks that there is some âjealousyâ by the local athletic authorities. 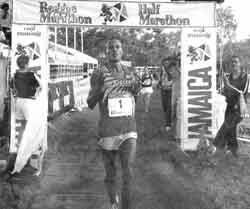 He was prevented from defending his Organisation of Eastern Caribbean States (OECS) Half Marathon title in St. Kitts last year. The 2005 OECS Half Marathon is scheduled for Grenada Sunday, December 12. Ballantyne is bent on repeating his success, but up to Wednesday there was no communication from the Amateur Athletic Association. He was buoyed by a series of recent successes. Ballantyne cruised to the Reggae Marathon title last Saturday morning in 2 hours, 28 minutes, 03 seconds. His closest rival was Jamaica Defence Forceâs Phillip Edwards 2:41.09, and Ebony Running Clubâs Andrew Gutzmore: 2:42: 06. Last week Saturday Ballantyne took a 10K in Mayaro, Trinidad and Tobago, and returned home in time to win the Penniston Educational Sports and Cultural Organisation (PESCO) 7th Annual South Leeward Road Race the following day. Ballantyne was ahead of the pack in a 15 K Arouca Classic staged in T &T September 24. Trinidad and Tobago seems to be one of his happy stomping ground. He is focussed on the Clico Marathon carded for February 27, 2005. He holds the record of 2:15:30 achieved in 2003, in one of his seven captures of that title.